MP High Court Recruitment 2018 – 739 Class IV Posts:- High Court of Madhya Pradesh, Jabalpur has published notification for filling up 739 posts of Driver, Peon/ Watchman/ Waterman, Gardener (Mali) & Sweeper. Desirous & eligible candidates can apply online from 01/12/2017 to 31/12/2017. For All Other : 8th Class pass. Starting Date of Online Application :01/12/2017. Last Date of Online Application : 31/12/2017. Application Procedure: Eligible candidates may apply online through the website http://www.mponline.gov.in from 01/12/2017 to 31/12/2017. High Court of Madhya Pradesh, Jabalpur has published latest notification for filling up 2910 posts of Stenographer, Assistant, English Stenographer, Computer Operator, Steno Typist & Liftman. Desirous & eligible candidates can apply online from 06/06/2017 to 05/07/2017. Starting Date of Online Application :06/06/2017. Last Date of Online Application : 05/07/2017. Application Procedure: Eligible candidates may apply online through the website http://www.mponline.gov.in from 06/06/2017 to 05/07/2017. 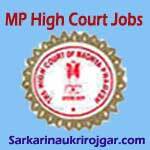 Subscribe our free job alert mail for MP High Court Recruitment 2018.